On a hot morning, there was an unusual bustle around the temple at Velingirayanpettai village in Cuddalore district of Tamil Nadu. There were around 50 people gathered under a tree outside the temple. A kilometre or two down the road were vanloads of policemen clustered around a canopy. People from neighbouring villages were trickling into the beachside venue for a public hearing on a Rs 300 crore ship building yard in Silambaimangalam on July 15. The project proponent, Goodearth, had got the requisite clearances in 2006 and acquired land as well. However due to financial problems, the project had been stalled till now. The people near the temple were fishermen from the village who were boycotting the public hearing. They however, passed on their concerns to the local MLA, K Balakrishnan. 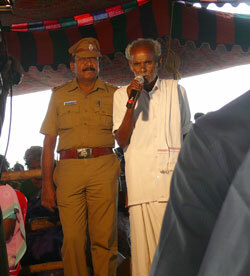 The MLA rues that the residents of the village were not informed about the hearing. “The information has to be given in the local language for 10 km radius through notices, newspapers and tom tom. This was not done and hence a new hearing should be held after the procedures are followed,” he adds. People are worried the project will affect fisheries as hard engineering structures would cause soil erosion. As well as their access to the sea will be curbed. “There are many industries having jetties on the coast here. This causes a block for fishermen. They have to go a longer way around,” says S Ramanathan of SACEM, a community group that monitors pollution in the Cuddalore area. V K Chezhiyan, president of Killai Panchayat and a fisher says, “We fish over a larger area and we will not be able to put out our nets if the yard comes up. We have seen how other projects on the coast are making things difficult for fishermen so we do not want this project,” he says. This project would exacerbate erosion problem on the coast, he adds. Farmers are also worried about the company’s use of groundwater. The CRZ clearance, issued by the environment ministry in February, says no groundwater is required. But the environment impact assessment talks of extraction of 40,000 litres of water daily. “The company claims this would be from outside the CRZ area but it will still have an impact on the community’s drinking water,” counters Balakrishnan. Several residents dismissed the idea the project would provide employment. “There are also the mangroves at Pichavaram a few kilometres south of the site. 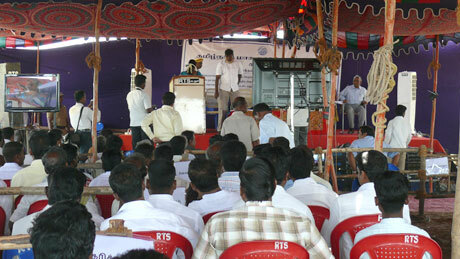 The impact of the project on these mangroves has to be studied,” says Karupaga Selvam, counselor from Killai village. Balakrishnan also brought to everyone’s attention a little known fact. The company had applied for permission to set up a phosphate plant at the project site. He wanted to know whether the public hearing was only for the just the shipbuilding yard or the phosphate plant as well. The company, when given time by collector T Amuthavalli for rebuttal, said that it was only the yard but did not confirm the rumours about the phosphate plant. “At this point there is no phosphate plant coming up,” says Anandh Sai , the company representative. This was greeted with anger by the community with several people shouting that the question of the phosphate plant coming up had not been answered adequately. For over two hours, a number of community members spoke against the project. None of them supported the project. The shipyard will be a little south of Nagarjuna refinery and other industries coming up in phase 3 of the SIPCOT estate in Cuddalore. Cuddalore is known as an industrial hot spot and is on the environment ministry’s list of 88 most polluted areas in the country. Until recently there was a moratorium on expansion and new industries in the area. “Of all the industries coming up here, ours will have the least impact on the environment. At the most two ships will come out of the yard in a year so there will be no disturbance to fishermen. And these ships will move only along a certain channel because of requirements of depth,” says Sai. The ship building yard needs 60.77 hectares (ha) in the first phase and will consist of two breakwaters (300 m and 1430m long), two jetties, and one supply quay. While he was answering the community’s questions, there was a palpable tension among the community. Suddenly he was interrupted by several people yelling at him not to tell lies, to come off the stage and they would deal with him. Meanwhile the press and the official videographer were scrambling to catch all the action. Before things got out of hand, however, the police stepped forward to calm everyone down. The collector quickly wound up the hearing saying, “We have heard everyone’s viewpoint. The company refuting the peoples’ allegations will not mean that your fears will not be recorded. This public hearing does not have the power to decide the fate of the industry, we are only mandated to record the community’s support or opposition to the project. That has been done and will be passed on to the authorities concerned”. In almost all the Development Projects, we can clearly observe that the voice of the people of soil or the native people, not considered by the Policy makers. When the sea environment is affected; mongrove forests affected;ground water affected; soil erosion happened; fishes affected; how the Govt agency and ministries giving 'Approval' for these projects? Whether the shipyard is for fishermen or for others? Whether the fishermen using small boats or ships to access this? When the livelihood of fishermen is going to be affected, what development we are going to make there? for the welfare of whom? and how? What are the welfare measures taken for those people? What alternative support system or arrangement we have for the fishermen who are going to affected by the "Displacement" because of this project? whether it is relief or rehab? When it is limited to relief, then what about their future? To conclude this, we came to know, these developmental projects are prepared for the development of the 'already developed people' by violating environmental and human rights rules and regulations without minding the people who is going to affected. The policy makers also should keep all the questions raised above and should consider the "people's opinion".